Bitcoin is the most prominent example of so-called cryptocurrencies: digital currencies that use encryption techniques for generating and verifying transactions. Bitcoin may have fallen victim to volatility, but Switzerland has become fertile ground for start-ups banking on a different, digital future for currencies. And the Swiss franc’s recent activity has only added fuel to the fire. When the Swiss National Bank (SNB) announced it had un-pegged the Swiss franc from the euro on January 15, sending the franc’s value skyrocketing, bitcoin enthusiasts took to the Web to say “I told you so”. While the mainstream media had basically declared bitcoin deadexternal link after it lost 400% of its value since its height in November 2013 and was embroiled in a series of security scandals, the community supporting such digital currency – or cryptocurrency – saw the SNB’s move as validation that a de-centralised monetary system is the way forward. Johann Gevers hails from South Africa but now lives in Switzerland where he heads a start-up called Monetas. He was “very happy to see” the SNB’s move which he saw as unsustainable. The move, he says, exposes the flaws in the idea of having a few people calling the shots at a central bank, which runs “completely counter” to his business’s philosophy of giving individual citizens control over their financial lives. Bitcoin: The most-used type of digital currency, invented in 2008 by a person with the moniker Santoshi Nakamoto. Accepted by hundreds of online vendors worldwide, including Amazon and Virgin. Monetas, in a nutshell, is a global payment system that can transfer any currency or commodity to another person anywhere in the world through a phone app, without a central authority controlling the transaction. To do so, it relies on the underlying technology behind bitcoin transactions. Its ultimate goal is what Gevers calls “the democratisation of finance” across borders and currencies. Over the past several years, Gevers has been working to bring other likeminded people to Zug, south of Zurich, in order to establish a hub for cryptocurrency start-ups which he calls ”Crypto Valley”. Among the businesses headquartered there are Ethereum, which has launched its own cryptocurrency called “ether” and a platform for developers to build systems around it, and Bitcoin Suisse, a provider of bitcoin ATMs. “There are now about 15 companies that are part of the digital finance compliance association, which I founded last year and which is designed to create a legal framework that’s friendly to digital finance,” Gevers says. On the other side of Switzerland, in the French-speaking city of Neuchâtel, Adrien Treccani is also hard at work on three bitcoin-related companies at another soon-to-be-launched cryptocurrency start-up hub known as Bitcoin Factory. A doctoral student in mathematical finance at the Swiss Finance Institute, Treccani is at home in two surroundings: the high-risk start-up culture surrounding cryptocurrency and the traditional Swiss financial world. When the euro peg was removed, he also believed the national bank’s policy had an expiration date and supported the decision – but he found reactions differed depending on which environment he was in. “I was in favour of leaving the peg and I saw that many people in the bitcoin community had the same feeling, but not many people around me [in the finance world] agreed,” he says, chalking up the difference in opinion to cryptocurrency enthusiasts’ dislike of “the central bank’s cheating with the currency”. Gevers would like to take things further and work directly with central banks “to have them see that the course they have been following so far is simply unsustainable and very dangerous to the social fabric”. For starters, one of his company’s goals is to talk to central banks about using the Monetas system and the cryptocurrency technology behind it in order to more sustainably issue currency. However, former UBS chief historian Robert Vogler puts that idea in the category of “wishful thinking” and the Swiss National Bank did not comment on its willingness to entertain such a concept. For Vogler, the current cryptocurrency investment craze has shades of other movements in history following financial crises. He points to Silvio Gesell’s theories about issuing money at a constant value in the wake of a depression in Argentina in the late 1800s, or the WIR independent currency system that was founded in Switzerland in the 1930s and now also functions as an electronic currency. For him it’s no surprise that ideas for such new currencies always pop up following major financial and economic crises. “These aspirations to remove oneself from reality have become a bit symptomatic, believing you can avoid certain dangers in the current system,” Vogler believes. And he, like other cryptocurrency sceptics, points to bitcoin’s volatility as a major red flag for its future success. And as Boston University finance and management professor Zvi Bodie pointed out to the PBS NewsHourexternal link, part of the trouble with bitcoin is that it’s not backed or guaranteed by any government, third party (like a credit card company) or physical, independently valuable entity (like gold). “Bitcoins seem to have no independent source of value other than that a group of digital experts have agreed to accept them,” Bodie said. No one is denying that bitcoin is volatile or the fact that it’s an extremely high-risk investment, says Treccani. That’s one of the three main things he thinks are holding it back from becoming more mainstream, the others being its accessibility and its security. Right now, when compared to use of other payment methods like credit cards, bitcoin remains a niche; according to the Financial Times, the bitcoin system processes about 100,000 transactions a day, versus 150 million for Visa. And in Switzerland, the groups of people who meet regularly via the platform Meetup.com to discuss cryptocurrency issues and to buy and sell bitcoin are fairly homogeneous, mostly made up of male technology enthusiasts. But Treccani points out that the cryptocurrency itself and the system it brings with it are two different things. That’s the innovation fuelling start-ups like those populating Crypto Valley and Bitcoin Factory. And Treccani sees more of his colleagues in the financial sector coming around to the technology. “They might still not know why it is useful or different from the current system, but they see that bitcoin is a credible next step in financial innovation,” he says. Recently, the surest sign of the traditional financial world’s growing interest in cryptocurrency may have been the $75 million investment investment by the New York Stock Exchange and other partners in Coinbase, a major online marketplace for trading and storing bitcoin. Mike Hearn, a freelance cryptocurrency software developer based in Switzerland, thinks bitcoin-related companies offer a specific kind of investment opportunity that’s hard to find these days. But Hearn doesn’t think such large-scale investments as the NYSE’s would have happened in Europe, where he believes people are much less likely to put lots of money into a venture linked to bitcoin’s volatile reputation. Fabio Federici agrees. The gun-shy investor culture was one reason why he incorporated his start-up in Silicon Valley instead of in Switzerland, where he grew up and went to school. His company is designed to let merchants, investors and others have easy access to the information stored in the bitcoin blockchain, the digital ledger of all bitcoin transactions. But Gevers, Treccani and others working to develop the Swiss cryptocurrency start-up sector would argue Switzerland has more working for it than against it when it comes to being an attractive place to launch a company. For one, the Swiss government and the Swiss National Bank issued a reportexternal link on regulating bitcoin last year, defining bitcoin as a means of payment like any other currency, outlining guidelines for merchants and traders. “At least they saw bitcoin coming and have given a clear statement to start-ups and companies about how to deal with this technology,” Treccani says. It amounts to a clearer regulatory environment for cryptocurrency in Switzerland, Treccani argues, compared with a certain degree of uncertainty in neighbouring countries or in the United States. Cryptocurrency’s unpredictability is also the most intoxicating thing about it for investors. For now, that makes its future anything but certain and has led its enthusiasts to take its erraticism in their stride. “I wish bitcoin were more stable, but you never know when even very stable national currencies can suddenly go crazy,” says Hearn. Bitcoin technology launches a Swiss start-up scene Veronica DeVore Mar 18, 2015 - 11:00 Bitcoin may have fallen victim to volatility, but Switzerland has become fertile ground for start-ups banking on a different, digital future for currencies. And the Swiss franc’s recent activity has only added fuel to the fire. When the Swiss National Bank (SNB) announced it had un-pegged the Swiss franc from the euro on January 15, sending the franc’s value skyrocketing, bitcoin enthusiasts took to the Web to say “I told you so”. While the mainstream media had basically declared bitcoin dead after it lost 400% of its value since its height in November 2013 and was embroiled in a series of security scandals, the community supporting such digital currency – or cryptocurrency – saw the SNB’s move as validation that a de-centralised monetary system is the way forward. Johann Gevers hails from South Africa but now lives in Switzerland where he heads a start-up called Monetas. He was “very happy to see” the SNB’s move which he saw as unsustainable. The move, he says, exposes the flaws in the idea of having a few people calling the shots at a central bank, which runs “completely counter” to his business’s philosophy of giving individual citizens control over their financial lives. Cryptocurrency: a glossary Bitcoin: The most-used type of digital currency, invented in 2008 by a person with the moniker Santoshi Nakamoto. Accepted by hundreds of online vendors worldwide, including Amazon and Virgin. 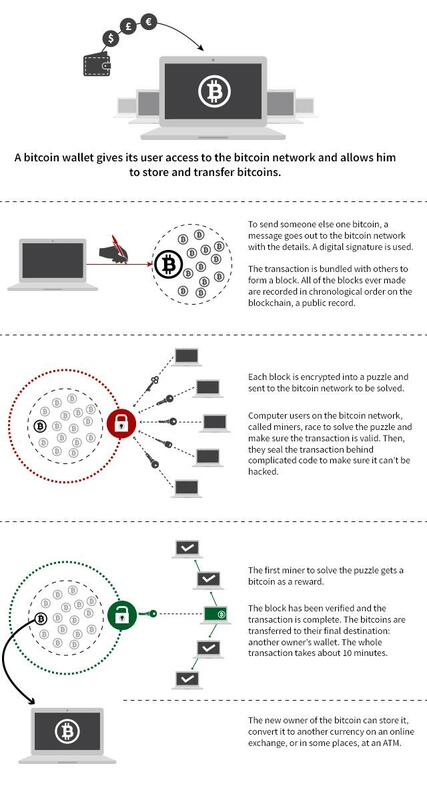 Cryptocurrency: A form of money that uses cryptography to control its creation and management Blockchain: The public digital ledger keeping track of all bitcoin transactions Monetas, in a nutshell, is a global payment system that can transfer any currency or commodity to another person anywhere in the world through a phone app, without a central authority controlling the transaction. To do so, it relies on the underlying technology behind bitcoin transactions. Its ultimate goal is what Gevers calls “the democratisation of finance” across borders and currencies. Over the past several years, Gevers has been working to bring other likeminded people to Zug, south of Zurich, in order to establish a hub for cryptocurrency start-ups which he calls ”Crypto Valley”. Among the businesses headquartered there are Ethereum, which has launched its own cryptocurrency called “ether” and a platform for developers to build systems around it, and Bitcoin Suisse, a provider of bitcoin ATMs. “There are now about 15 companies that are part of the digital finance compliance association, which I founded last year and which is designed to create a legal framework that’s friendly to digital finance,” Gevers says. On the other side of Switzerland, in the French-speaking city of Neuchâtel, Adrien Treccani is also hard at work on three bitcoin-related companies at another soon-to-be-launched cryptocurrency start-up hub known as Bitcoin Factory. A doctoral student in mathematical finance at the Swiss Finance Institute, Treccani is at home in two surroundings: the high-risk start-up culture surrounding cryptocurrency and the traditional Swiss financial world. When the euro peg was removed, he also believed the national bank’s policy had an expiration date and supported the decision – but he found reactions differed depending on which environment he was in. “I was in favour of leaving the peg and I saw that many people in the bitcoin community had the same feeling, but not many people around me [in the finance world] agreed,” he says, chalking up the difference in opinion to cryptocurrency enthusiasts’ dislike of “the central bank’s cheating with the currency”. Gevers would like to take things further and work directly with central banks “to have them see that the course they have been following so far is simply unsustainable and very dangerous to the social fabric”. For starters, one of his company’s goals is to talk to central banks about using the Monetas system and the cryptocurrency technology behind it in order to more sustainably issue currency. However, former UBS chief historian Robert Vogler puts that idea in the category of “wishful thinking” and the Swiss National Bank did not comment on its willingness to entertain such a concept. For Vogler, the current cryptocurrency investment craze has shades of other movements in history following financial crises. He points to Silvio Gesell’s theories about issuing money at a constant value in the wake of a depression in Argentina in the late 1800s, or the WIR independent currency system that was founded in Switzerland in the 1930s and now also functions as an electronic currency. For him it’s no surprise that ideas for such new currencies always pop up following major financial and economic crises. “These aspirations to remove oneself from reality have become a bit symptomatic, believing you can avoid certain dangers in the current system,” Vogler believes. And he, like other cryptocurrency sceptics, points to bitcoin’s volatility as a major red flag for its future success. “If you look at its huge volatility compared with the dollar or the franc, for me it’s all somehow wishful thinking. The idea is admirable but somehow not leading to the goal.” And as Boston University finance and management professor Zvi Bodie pointed out to the PBS NewsHour, part of the trouble with bitcoin is that it’s not backed or guaranteed by any government, third party (like a credit card company) or physical, independently valuable entity (like gold). “Bitcoins seem to have no independent source of value other than that a group of digital experts have agreed to accept them,” Bodie said. Currency versus concept No one is denying that bitcoin is volatile or the fact that it’s an extremely high-risk investment, says Treccani. That’s one of the three main things he thinks are holding it back from becoming more mainstream, the others being its accessibility and its security. Right now, when compared to use of other payment methods like credit cards, bitcoin remains a niche; according to the Financial Times, the bitcoin system processes about 100,000 transactions a day, versus 150 million for Visa. And in Switzerland, the groups of people who meet regularly via the platform Meetup.com to discuss cryptocurrency issues and to buy and sell bitcoin are fairly homogeneous, mostly made up of male technology enthusiasts. But Treccani points out that the cryptocurrency itself and the system it brings with it are two different things. “You have to separate the bitcoin currency from bitcoin technology,” he says. “Then you start seeing the real value in the underlying innovation.” That’s the innovation fuelling start-ups like those populating Crypto Valley and Bitcoin Factory. And Treccani sees more of his colleagues in the financial sector coming around to the technology. “They might still not know why it is useful or different from the current system, but they see that bitcoin is a credible next step in financial innovation,” he says. Recently, the surest sign of the traditional financial world’s growing interest in cryptocurrency may have been the $75 million investment investment by the New York Stock Exchange and other partners in Coinbase, a major online marketplace for trading and storing bitcoin. Investment potential Mike Hearn, a freelance cryptocurrency software developer based in Switzerland, thinks bitcoin-related companies offer a specific kind of investment opportunity that’s hard to find these days. “If you look around in the technology sector there aren’t a lot of areas with high risk, high growth potential,” he says. “But bitcoin started from nothing with one guy and now it’s this global phenomenon, everybody has heard about it and it’s grown a lot. So why not take a gamble on that?” But Hearn doesn’t think such large-scale investments as the NYSE’s would have happened in Europe, where he believes people are much less likely to put lots of money into a venture linked to bitcoin’s volatile reputation. Fabio Federici agrees. The gun-shy investor culture was one reason why he incorporated his start-up in Silicon Valley instead of in Switzerland, where he grew up and went to school. His company is designed to let merchants, investors and others have easy access to the information stored in the bitcoin blockchain, the digital ledger of all bitcoin transactions. “I definitely think the entire start-up ecosystem in Switzerland is very small and it’s not the ecosystem itself, it’s the mentality of the Swiss and other EU countries that are less willing to take risks on very early-stage companies. You kind of need that, especially in the bitcoin space, because you are not only betting on a start-up that’s going to work or not but also on the entire industry.” But Gevers, Treccani and others working to develop the Swiss cryptocurrency start-up sector would argue Switzerland has more working for it than against it when it comes to being an attractive place to launch a company. For one, the Swiss government and the Swiss National Bank issued a report on regulating bitcoin last year, defining bitcoin as a means of payment like any other currency, outlining guidelines for merchants and traders. “At least they saw bitcoin coming and have given a clear statement to start-ups and companies about how to deal with this technology,” Treccani says. It amounts to a clearer regulatory environment for cryptocurrency in Switzerland, Treccani argues, compared with a certain degree of uncertainty in neighbouring countries or in the United States. Cryptocurrency’s unpredictability is also the most intoxicating thing about it for investors. For now, that makes its future anything but certain and has led its enthusiasts to take its erraticism in their stride. “I wish bitcoin were more stable, but you never know when even very stable national currencies can suddenly go crazy,” says Hearn. Arabic (ar)المصرف الوطني السويسري يتخذ إجراءً "صادما ومفاجئا"
26 There are 26 comments on this article. The Swiss National Bank took everyone by surprise by scrapping the euro cap on the franc. If you have only a vague idea what that means, read this. Spanish (es)¿Qué significa el anuncio? For more than a decade, young Swiss entrepreneurs have benefited from training aimed at helping them get off on the right foot in the business world.